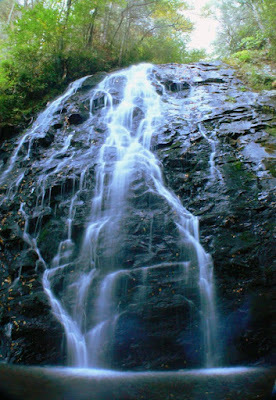 Yesterday my birthday request was to do and see something that I haven't seen before and the first place I could think of was Crabtree Falls. I have wanted to take this hike for sometime now and was very happy that we chose yesterday to finally go. It is getting colder now so it was a bit chilly at the bottom of the falls but the hike out got our heart racing. Total it ended up being a moderately strenuous 2.5 mile loop. There was also camping at Crabtree Meadows with tent sites & hook-ups; I was jealous of the folks gathered round the fires and I so wished that we were able to camp but we didn't. There will be some time for that when we get back from Vegas, soon enough. I am so very excited about Fall and the magnificent colors it brings - it's an absolutely beautiful time of the year. Living in Boone you are exposed to actual seasons that change unlike Florida. Winter is a trying time but you get used to it after a while, last year it only snowed like 5-6 times it seems. I enjoy the snow, it makes me feel like a kid again. Snowball fights are pretty darned fun too. Listen to me; it's only getting down to about 54 right now which isn't too too cold but the house is poorly insulated and it feels a lot colder inside the house than it really is outside! We'll worry about those sorts of things when we get back from our trip though - window covering, heater, wood............. On top of that our water heater is acting up right now. The water doesn't get very cold which is no good because it makes me so tense to try and shower under that cold water I just can't take it. Maybe I'll try not to bathe until Vegas! ewe gross........whatever cause I do that all the time, hahaha. Well, on that note I'm going to take my dirty behind to the kitchen and clean up. We love to tent camp at "Crabtree". It's always our first choice. The falls are beautiful, too.